Crossing land borders can often challenge your preconceptions of a country as a simple line on a map does little to the physical characteristics of the landscape, people’s faces and the general atmosphere. It sometimes takes a few days to really feel like you are in a different country. 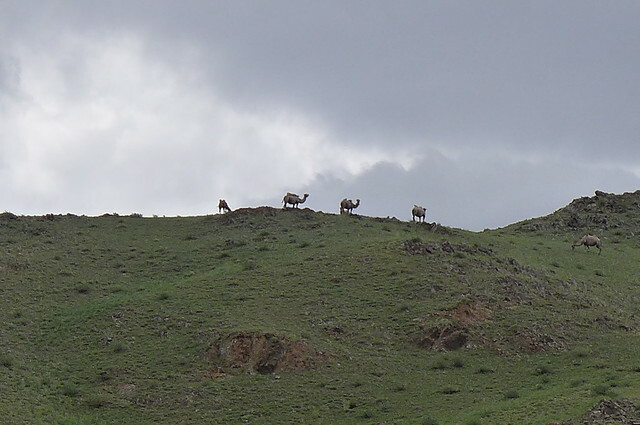 However, when I crossed into Mongolia my first few hours in the county instantly met with the imagery in my mind. There was no longer asphalt, instead the choice between a rutted and rocky raised ‘road’ section early on in its construction phase, or a selection of hard packed dirt tracks running parallel. 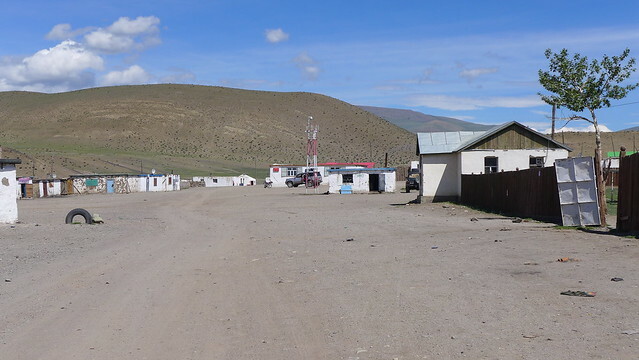 Outside of the small border town the wide green valley was dotted with small clusters of white canvas covered gers (the Mongolian word for yurt), with livestock grazing, kids playing outside and waving us over as we cycled past, and young men bumping across the grass on horses and motorbikes. In spite of this idyllic scene, the sight of the latter played on my mind as Frank and I had both heard stories and warnings of robbers and scams involving fresh faced motorbike and cycle tourists being invited to people’s gers by guys on motorbikes and then getting beaten up and losing their stuff. We passed one guy fitting this description waiting on a bridge; asking us if we wanted a place to stay in the next town and how many other tourists were at the border crossing? After this encounter we vowed to push on as much as we could for the rest of the afternoon to try and put some kms between us and the border, in particular getting past the first town of Tsagannuur. We briefly got a helping hand from the elements and the road as we rolled on to smooth downhill asphalt again and a fierce tailwind kicked up. Without even pushing the pedals we were sailing along at nearly 40kph and the town was soon in sight, unfortunately so too were the heavy black clouds the wind was bringing with it. As huge raindrops started to thunder down we swerved off the road and took shelter behind the first empty looking building we could find on the outskirts of town. Huddled against the wall watching the near horizontal rain flying past us, we were thankful for being able to find somewhere out of the weather but anxious to keep moving to avoid any trouble. Despite the downpour a woman emerged from another of the single story, ramshackle buildings and came over to us. I am sorry to say we were both instantly wary and our suspicions weren’t eased by the fact she was wearing an outdoor sports branded hat and leggings, so we declined when she invited us to come to her house for tea. A guy also braved the weather to invite us, we declined again and peered round the wall hopeful that the weather would clear. But after 45 minutes or so it was clear it wouldn’t and when the next car crawled by and the couple in the front invited us, we saw the four kids in the back and decided to accept their offer and follow them to sit out the rain. To our embarrassment the first woman also followed on her bicycle and it turned out she was the brother of the driver. 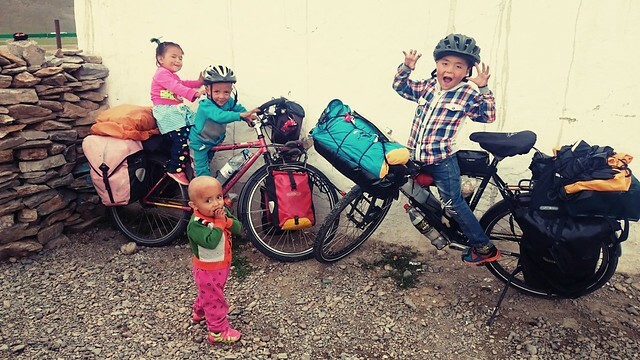 We were ushered into a simple two room building in which the wood stove was instantly lit and the children immediately wanted to play with our camera phones, maps, bikes and anything they could get their hands on. A pan of salt milk tea was brewed up and the family welcomed us to stay the night if we wished, with the extra ‘bonus’ that they would be slaughtering a sheep to celebrate their brother’s engagement! The kids were curious about everything and their parents spoke some English; telling us that the next day would be the national elections and pointing out the candidate they would be voting for on a poster on their wall (seemingly some kind of relation). They also showed us some phone pictures of other tourists they had invited to their home, including the Korean guys I had met at the pass in Russia. 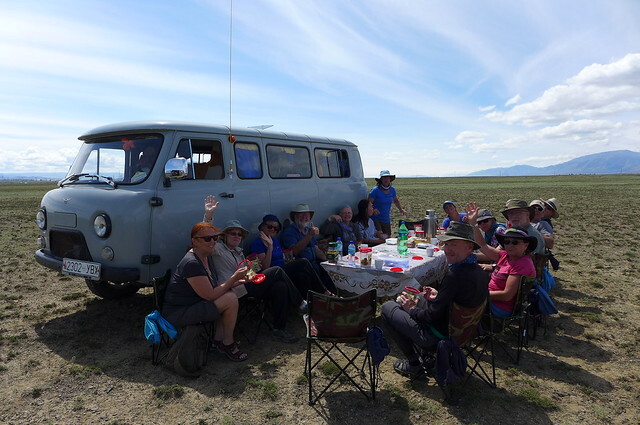 Reassured of genuine hospitality, warm and with food in our stomachs we accepted their offer to stay the night and spent the rest of our first evening in Mongolia acting as children’s entertainers, English teachers and part-time goat herders (for Frank anyway). The sheep was slaughtered in the backyard with all the kids around and swiftly butchered by the father. We didn’t get much sleep as the time had changed when we crossed the border, the kids stayed up forever, an alarm went off at 5:30am which carried on for half an hour and visitors started arriving on their way into town to vote early in the morning. As we got ready to get on our way, we both got our toothbrushes out and the kids instantly wanted to brush their horribly sugar corroded teeth too, causing a fight to break out over who got to use the single toothbrush first. Having offered $5 each as way of thanks we said our goodbyes and headed back to the road, passing jeeps packed full of people in their smartest clothes coming into town from the countryside to cast their votes. 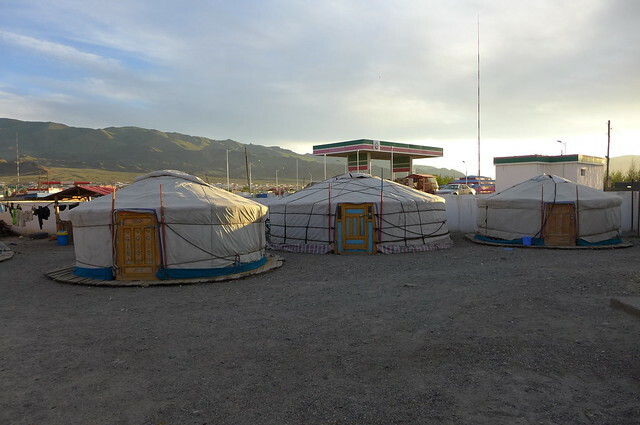 Having had to push so hard and cover so many kms in Kazakhstan and Russia I had planned a few days rest when I arrived in Mongolia and after an energy sapping climb over the pass out of Tsagaannuur, the asphalt road rolled gently into the aimag (region) capital of Ölgii where I would spend the next few days. We settled in to a guesthouse, which consisted of a number of gers in a walled yard at the back of a petrol station. The ‘rest’ days quickly disappeared catching up on the blog, cleaning clothes and kit, planning routes, visiting the Immigration Office to get a visa extension for Frank and enjoying a beer in the evening. 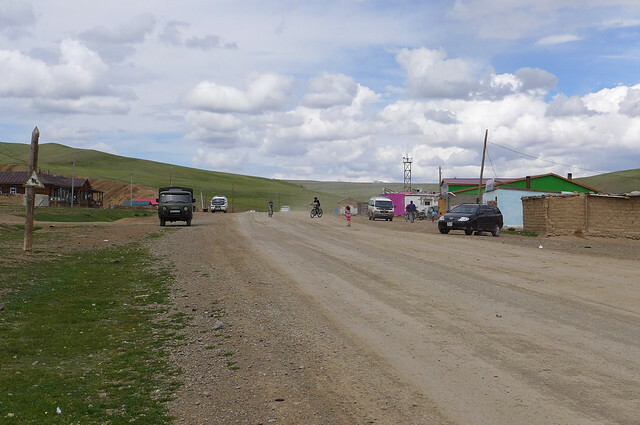 The latter was not so straightforward however as Bayan-Ölgii aimag’s population is something like 80% ethnically Kazak and predominantly Muslim, meaning alcohol sales are prohibited on Friday (the day after we arrived). Election day (when we arrived) also meant no alcohol could be sold – but thankfully our guesthouse owner was understanding and made some calls on our behalf to score some black market beer. 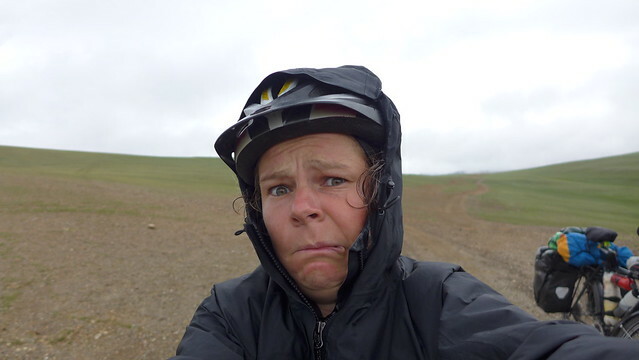 Deciding on a route across Mongolia was also somewhat time consuming as we tried to glean information from everyone we met and spoke to, along with scouring blog accounts of previous cyclists about the state of roads, tracks, rivers, bridges, water sources etc. 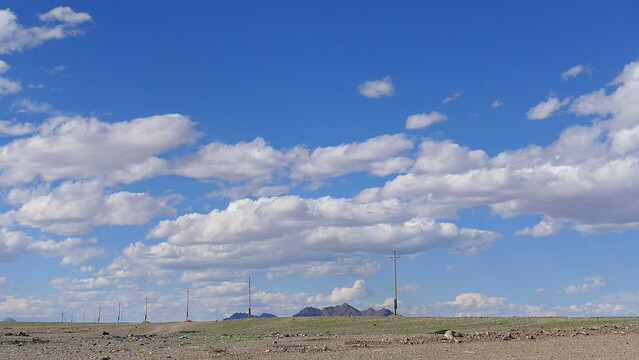 Nervous at what lay ahead, but keen to see what Mongolia had waiting for us, we headed out of Ölgii after 4 days in the direction of a small mining town called Khotgor. 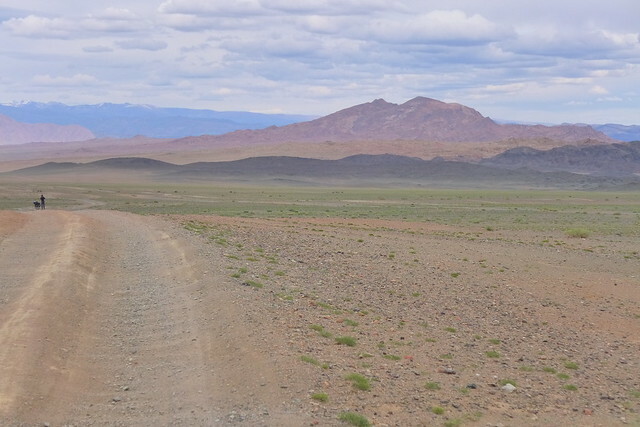 The gravel track led up into the hills surrounding the city and once over the first crest we were greeted by the huge open landscapes which would become so familiar during our journey through Mongolia. 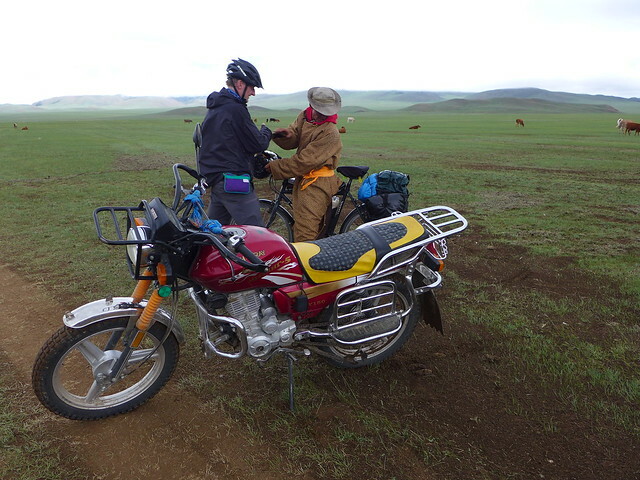 Frank and I had decided to continue travelling together and we bumped along trying to accustom our bikes, bums and bodies to the bumps and challenges of the infamous Mongolian tracks. 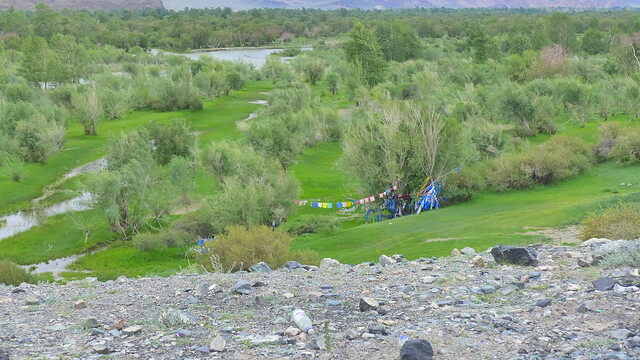 The point where the track joined a river was marked by a tree covered in blue cloth and prayer flags creating a wash of bright colors among the greens of the trees and bushes. 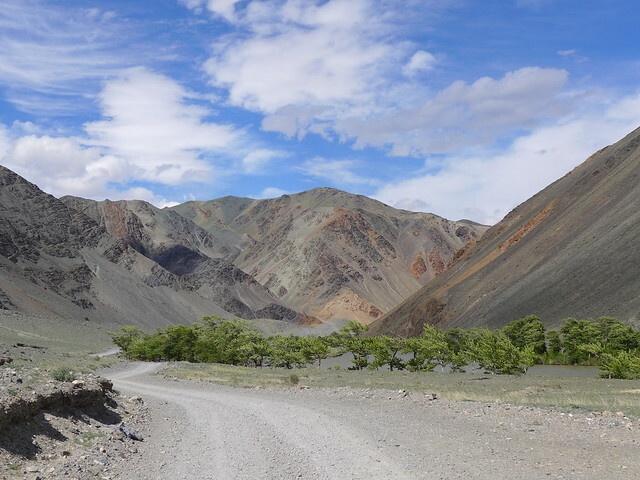 As the water ran into a narrowing canyon the purples, reds, browns and oranges of the rocky walls and hillsides reminded me of scenery along the Pamir highway in Tajikistan – a journey which had played a big part in sparking my desire to ride through Mongolia. Emerging from the canyon and climbing up to a small hill the scenery opened up and a series of tracks disappeared over the horizon in several directions next to piles of empty vodka bottles and a sign naming places we had never heard of and could not see on our maps. Following the small blue arrow on our mobile phone app map we chose a track heading in our direction and as it was by now getting late we started to look around for suitable places to make camp. With the wind now picking up we focused on some trees in the distance in the hope they would offer some shelter. The trees were near the river and as soon as we approached we were attacked by clouds of mosquitos each time the wind dropped. 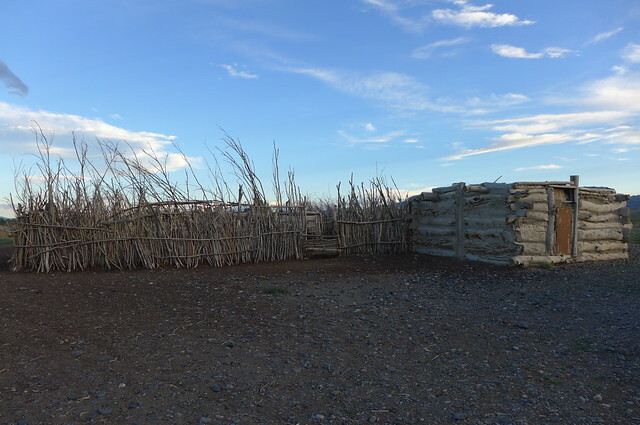 A number of mud and wood huts stood looking like an abandoned wild west ranch and one of the doors we tried was open. 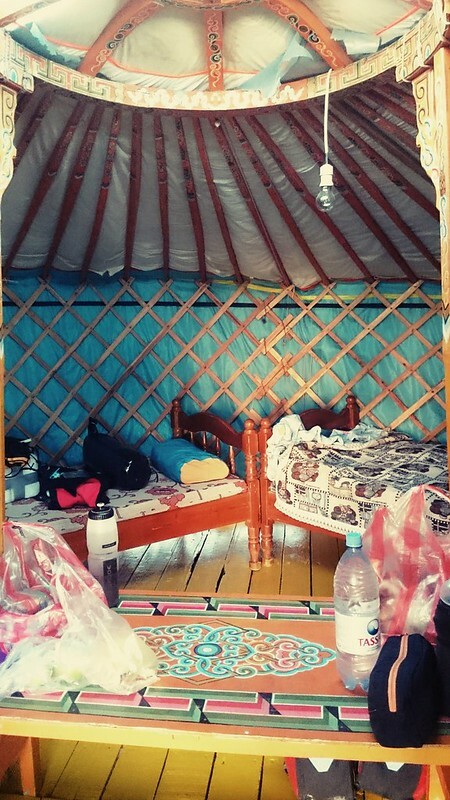 Inside was blissfully free of mosquitoes, wind and dust, so we camped the night inside. 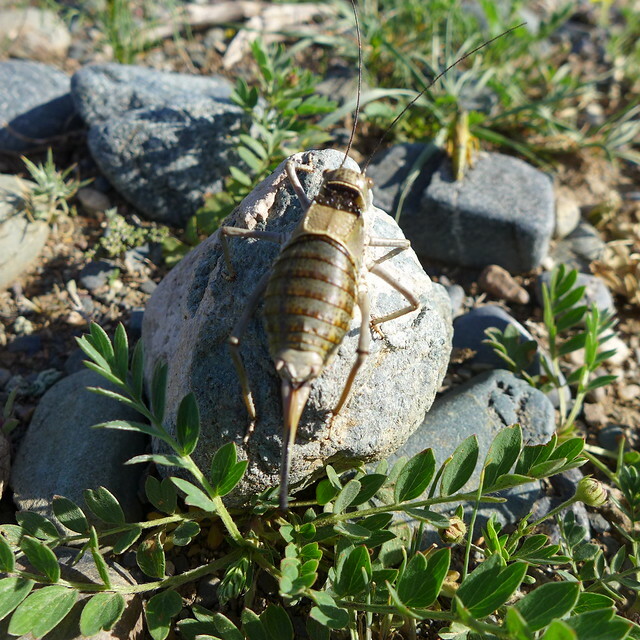 The next few days were a fierce introduction to Mongolian tracks and bugs. 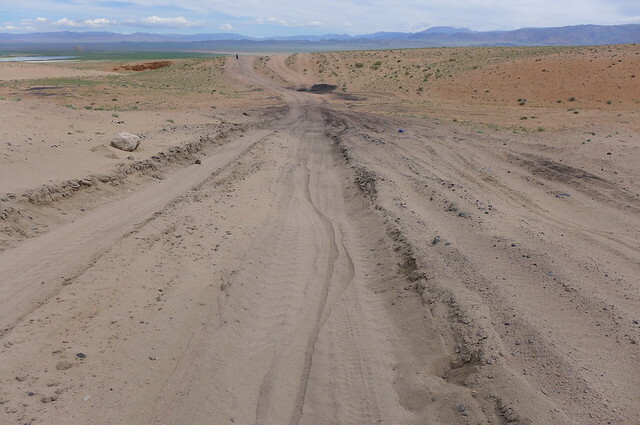 We had been warned that about 20km of the route passing Achit Nuur lake would be ‘buggy’, but had no idea how much this would conspire against us. 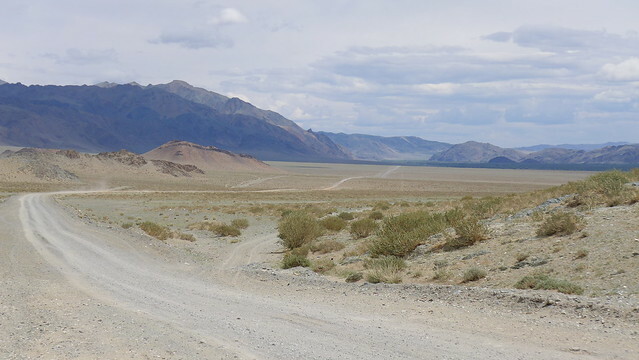 The tracks we were following were predominantly used by aging trucks carrying coal from the mine in Khotgor and subsequently they were sandy and rutted into endless washboard – two nightmares for cyclists. 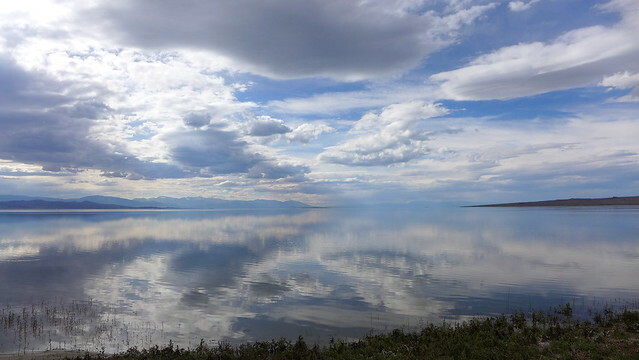 There was also precious little wind to keep the bugs away and as we were averaging a sand-skidding or washboard-bouncing 7kph, they swarmed around us; getting in our ears, behind our sunglasses, up our noses and the mosquitoes biting through our clothes. They were also undeterred by any repellent and we were forced to totally cover up and put on extra layers to prevent being eaten alive. Subsequently we were boiling in the warm sun and sweating buckets for long periods. We pitched our inner tents one lunchtime in order to escape the bugs and be able to eat, in the evenings we made camp and cooked dinner in our waterproofs to evade the bites and developed a technique of running round the tent several times before diving in to try and take as few bugs inside as possible. Even toilet stops became strategic operations to try and protect rarely exposed areas. My biscuits looked like my bites! As I lay in in the sanctuary of my tent in the evenings, savoring the rest bite from the bugs and the heat I could feel the aches and pains in my wrists, shoulders and back from trying to keep Raven upright and steady on the difficult tracks. 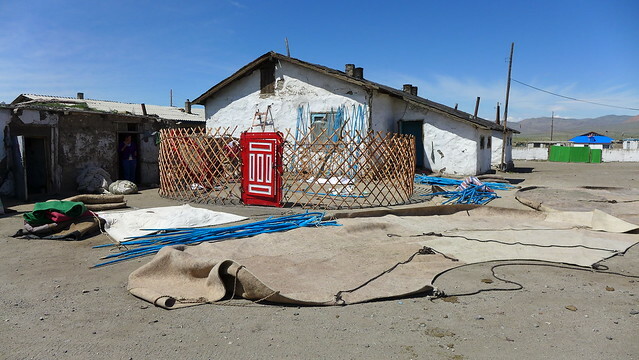 I anxiously wondered what the hell I had let myself in for and whether I would even be able to cope with this all the way to Ulaanbataar. 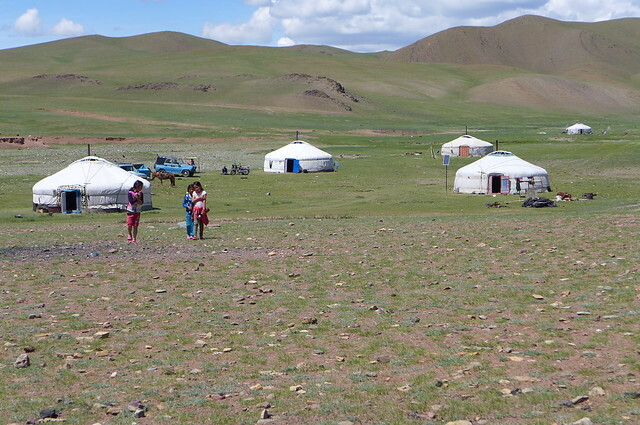 Thankfully, after the village of Khotgor the bugs eased off and s we climbed up through a picturesque green valley on hard packed mud tracks that weaved past groups of gers and up to another 2600m pass. Having huffed, puffed and pushed a little of the way to the top, I was catching my breath in front of the large ovoo (sacred piles of rocks serving as altars in Mongolian believes and usually covered in offerings including money, sweets, odd numbers of crutches, solar powered prayer wheels, bread, animal skulls, empty vodka bottles – the vodka is poured on the stones first! 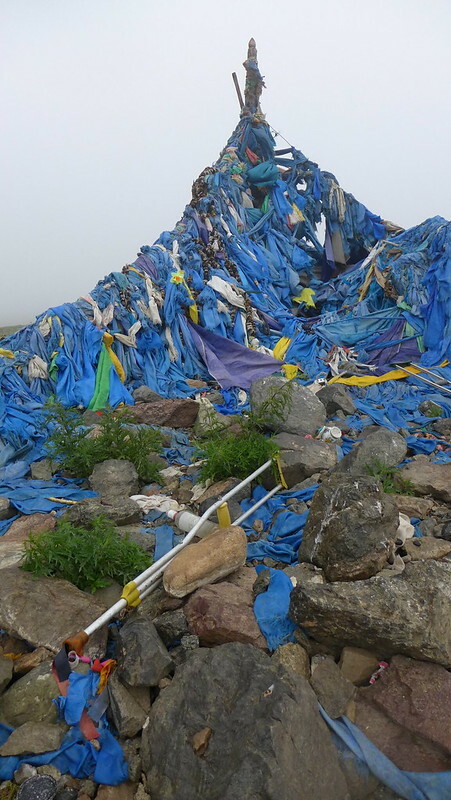 – and prayer flags) when a trio of Russian vans screeched up the hill and unloaded a group of tourists. Ignoring the ovoo they came over to us to ask if we had just climbed that track, and plenty more questions. 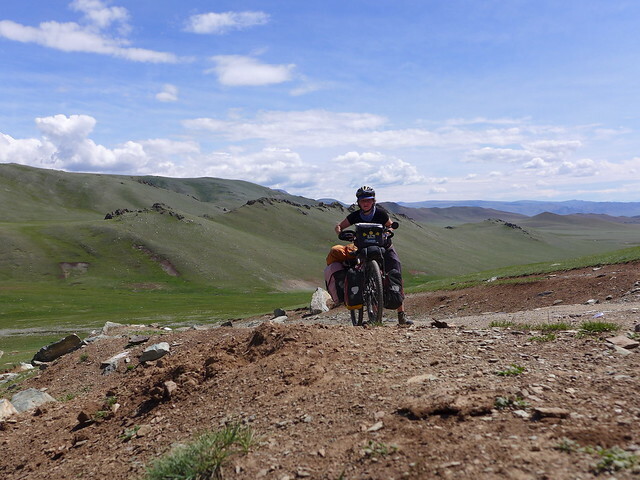 Usually hard climbs are rewarded with the adrenaline rush and the joy of cruising downhill on the other side, but we soon came to learn this is a rare occurrence in Mongolia. In this case the loose rocks and steep gradient were almost impossible to ride and after falling off several times I found myself having to get off and walk long sections of the descent. 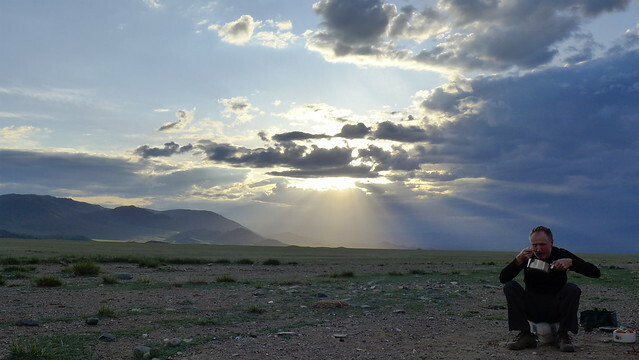 The one blessing that night was that we found a beautiful camping spot overlooking Uureg Nuur (lake), next to a stream where we could finally wash some of the grime and sweat of the last few days off and enjoy an evening without being eaten alive by mosquitoes. As we were drying ourselves off an old man on a horse came over from a ger on the opposite bank and dismounted, shook our hands warmly and then sat down in our camp. After asking where we were going, he seemed happy to say nothing more and continued to sit. We pointed at gers and flocks of sheep to ascertain which were his, and the sky to see if it would rain. Then his son drove over on a motorbike, asked for the battery from his phone and headed off towards the sheep on the hillside to start rounding them up. Shortly after the old man also got up and waved goodbye before remounting and slowly heading off towards the lake as the sun was setting through the clouds. 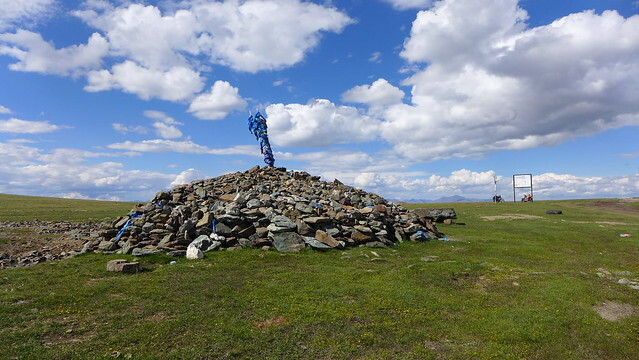 Another day of tracks and a complete soaking from a huge downpour saw us reach the top of Ulaan Davaa pass and another ovoo. Having discussed the fact that we might need some outside help to cross this country, or at least to improve our chances, we had read up on the correct procedure at an ovoo to please the gods. And despite the low cloud, rain and cold wind we each dutifully walked clock-wise round the pile of rocks three times, offering sweets as we went and making our wishes at the end. We were then pushed down the steep descent by an increasingly powerful tail wind, passing a shattered motorbike and its fallen and bloodied rider who was being helped into a jeep by the occupants, onto a vast open plain. 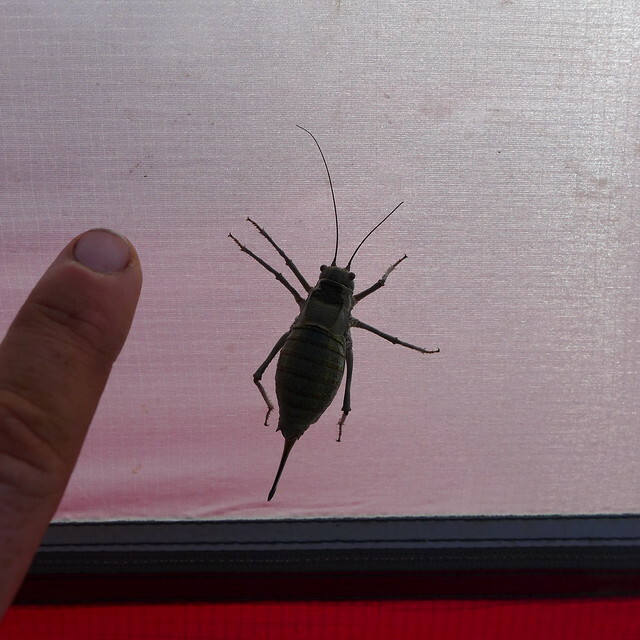 As we camped that night the mosquitoes once again buzzed outside the netting of my tent, and scratchy scurrying legs of other bugs could be heard all around as I watched a lightning storm illuminating the sky in the distance. 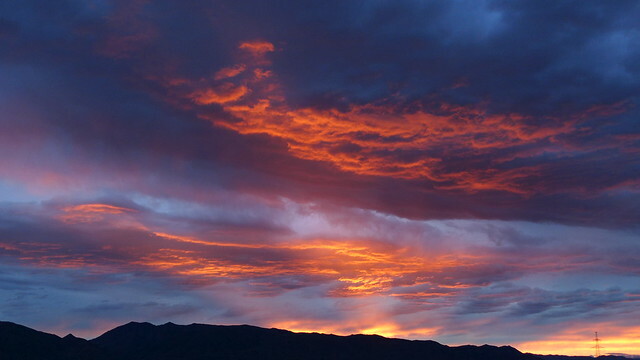 In the morning I woke to find a number of holes in my inner tent which had been chewed away by something that I was happy had not decoded to join me inside the tent. 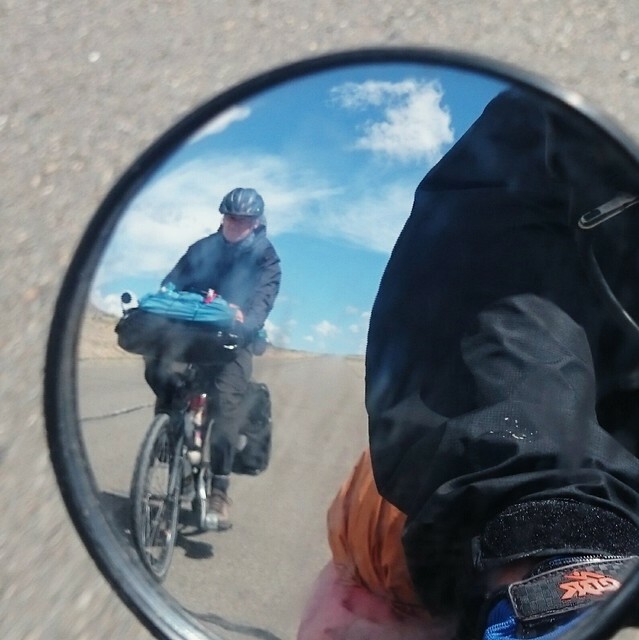 After just 6 days of riding we were both looking forward to a chance to take stock of our tough Mongolia by bike initiation as we rolled along the returning asphalt into Ulaangom. Not far from town we saw a trio of vans in the distance and a figure running across the scrub-land by the side of the road. It was the guide of the tour group we had met at the top of the first pass and she told us they wanted to invite us for the camp lunch they were just sitting down to. We happily accepted and joined the generous group of Canadian tourists for a sit down lunch with luxuries such as soft drinks and chocolate biscuits, before finding ourselves in the surreal situation of being asked to judge an ad hock singing competition between the occupants of the different vans and their guides. 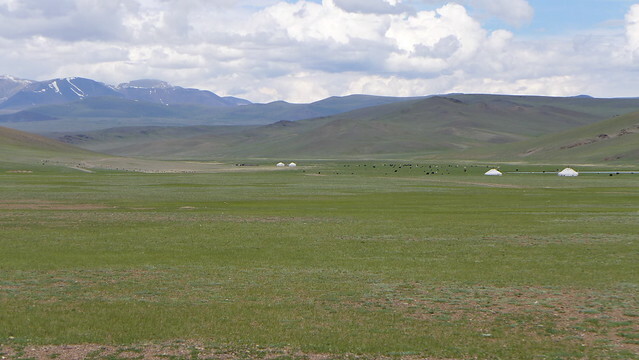 Standing in a field listening to Canadians and their Mongolian guide singing Frere Jaques, resisting the urge to scratch my million insect bites and looking forward to a night in a hotel – was not quite how I had imagined my ‘Welcome to Mongolia’. 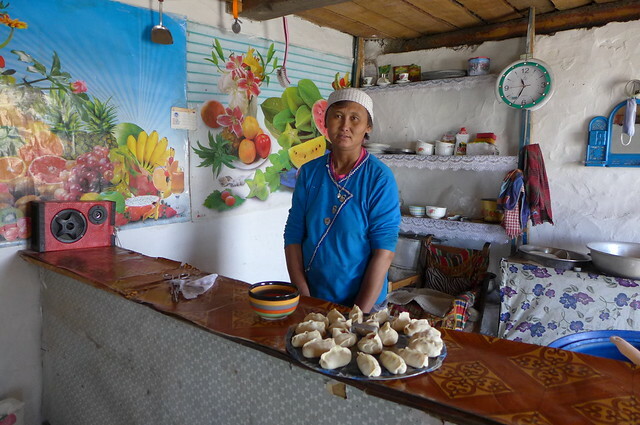 More more photos from my journey through Mongolia check out the gallery on my Flickr page.